Was driving my Alfa in Dearborn and saw their Model X.
I’ve done it again. Bonus Alfa Milano 80's Tribute. Alfa or Mercedes? Dachshund decides. Help my Alfa friends win the 4C! My friends are on their way to the 4C - anyone know where it is? Seems to be in Winner, SD. 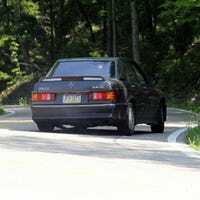 Welcome to EnthusiAtlas - your automotive enthusiast road map and enthusiast guide to drives, meets, shows, shops, and more. Plan your next trip, find a Cars and Coffee near you, or discover a local collection with the EnthusiAtlas database. Original post here. Went to Alfa Rob’s yesterday to check in on his Dino build. Made a short video while we had all of the Verdes together. I dug this up for a repost after driving Taylor’s 2.3-16 again this weekend. Mmm, that car.